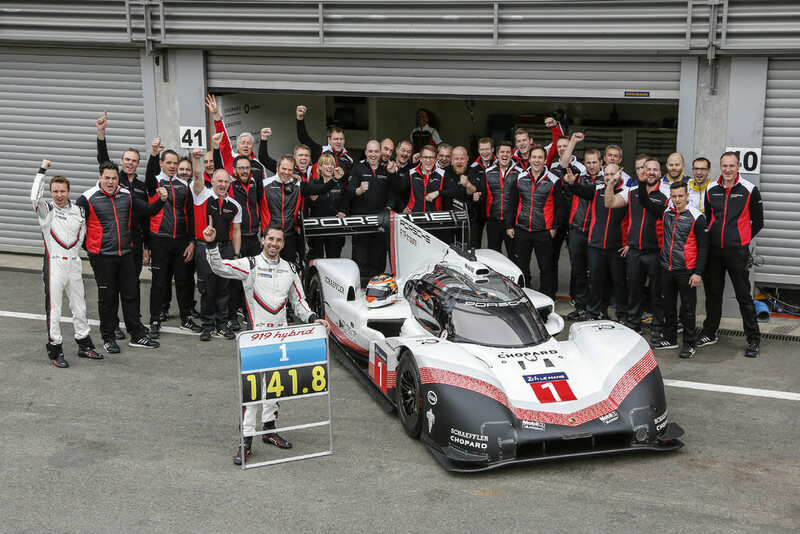 Today, on April 9, an evo version of the Le Mans winning Porsche 919 Hybrid established a new track record at Spa-Francorchamps. Porsche works driver Neel Jani lapped the 7.004 kilometre long Belgian Grand Prix Circuit in the Ardennes mountains in 1:41.770 minutes. The 34 year old Swiss has beaten the previous record by 0.783 seconds that was set by Lewis Hamilton (GB) at the wheel of a Mercedes F1 W07 Hybrid. Hamilton’s lap of 1:42.553 minutes dates back to August 26 in 2017 and secured him pole position for last year’s F1 race. Jani achieved a top speed of 359 km/h and an average speed of 245.61 km/h on his record lap that he started at 10:23 hrs. Ambient temperature was 11° Celsius, track temperature was 13° Celsius. The engineers also unchained the aerodynamics of the 919 Evo from the regulations. The new larger front diffuser now balances the new and very large rear wing, both of which have actively controlled drag reduction systems. The hydraulically operated systems trim the trailing edge of the front diffuser and opens up the slot between the rear wing main plane and the flap respectively in order increase the aerodynamic efficiency of the Evo. Underneath the Evo the turning vanes and floor have been optimized with fixed height side skirts to increase the aerodynamic performance again as efficiently as possible. In total the aero modifications resulted in 53 per cent higher downforce and an increase in efficiency by 66 per cent (compared to the 2017 Spa WEC qualifying). Monocoque: Composite material structure consisting of carbon fibre with an aluminium honeycomb core. The cockpit is closed.